Rabbi Eliyahu Landau (born 1872 Jerusalem, great-grandson of Avraham son of the Gaon), expert on the family of the Gaon of Vilna , told Rabbi Eliyahu Kushilevsky of Jerusalem, that the Gaon had two granddaughters who were orphaned from their parents at an early age and were then raised in the Gaon's household. Rabbi Landau claimed that many families were descended from these two granddaughters. Rivlin records one daughter of the Gaon's eldest son Shlomo Zalmen, named Treina. Since Shlomo Zalmen was born about 1758, it can be estimated that his two daughters were born about 1776 and 1777. The younger daughter was born about 1777 when her mother Rakhel (nee Kissin) seems to have died in childbirth, thus accounting for the fact that Shlomo Zalmen had no further children. it is known that Shlomo Zalmen was sickly and died during his father's lifetime , about 1780, apparently soon after the death of his wife, otherwise he would have remarried and other children would be recorded. This situation regarding the Gaon's son Shlomo Zalmen correlates with the story about the two orphan granddaughters of the Gaon. 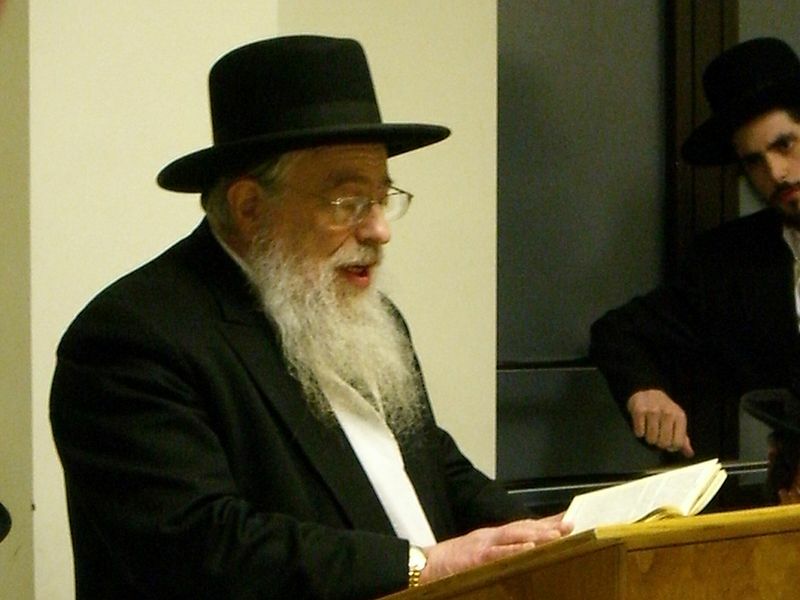 The Gaon had undertaken to support his son Shlomo Zalmen and daughter-in-law after her father, Yisrael Kissin of Vitebsk had completed his obligation in that respect. The Gaon did not live up to his promise and may have felt guilty after their death, hence his ‏adoption‏ of his granddaughters. Evidence for the existence of children of the Gaon's son Shlomo Zalmen appears in records of the "‏Kloiz Hagra" in Vilna which refer to trustees who were responsible for the property of Shlomo Zalmen's heirs.‏ These records clearly indicates that Shlomo Zalmen died during the Gaon's lifetime and that he left children, who had rights to the Gaon's property. The families Grad, Bardin, Lipshitz and Olkenitsky hold strong oral traditions of descent from the Gaon of Vilna. Yet this author has been unable to determine the exact nature of their descent. The author's extensive research of the family of the Gaon and his familiarity with the descendants of many branches of the family, lead him to the conclusion that the families are most likely not descended from the Gaon's sons Yehudah Leib or Avraham, nor are they likely to be descended from the Gaon's daughters. The author, having studied the details of these families, believed that it is most highly likely that they descend from the orphan daughters of Shlomo Zalmen, the Gaon's eldest son. Despite the lack of documented evidence, the author has included these families in Eliyahu's Branches, in the hope that such evidence will be discovered in the future. Since publication of Eliyahu's Branches in 1997, such evidence has not been forthcoming such that the above scenario requires review. Genealogist Alex Friedlander, aside from his descent from the Gaon through the Friedlander family, also holds a strong tradition of descent from the Gaon of the Bardin family. The Bardin family was intermarried with the Friedlander family, but a number of branches of the family hold a tradition of descent from the Gaon, independent of the Friedlander tradition. The evidence lead this author to conclude that Rakhel, the wife of Yaakov Bardin (born about 1770 in Suwalki Guberniya), was a daughter of Rabbi Shlomo Zalmen, the Gaon's eldest son. This scenario is compatible with the tradition related by Rabbi Eliyahu Landau about the families descended from two orphaned grand-daughters of the Gaon. surname Bardin. The origin of the name most likely relates to the phrase "‏Ben Av Bet Din",‏ son of the head of the rabbinic court, who was usually the Chief Rabbi of a town. This form of surname adopted by the Jews was based on an abbreviation of either the individual's name, title or occupation. Given that the Rabbi (Av Bet Din) of Serhei, Avraham( born about 1730) was the father-in-law of Yehudah Leib (1764 -1816) son of the Gaon, and thereby already associated with the Gaon's family, it is possible that, when a match was sought for the earliest recorded Bardin, Yaakov (born about 1770), a suitable bride was sought from the family of the Gaon. It is possible that the Bardin family can be identified from a list of individuals in Serhei who subscribed to a book published in 1795. "The Rabbi the great luminary, our teacher Avraham, may his light shine forth B"D (Beit Din) of the holy community of Lazdei". Rabbi Avraham's father, Rabbi Yekhezkel was Chief Rabbi of Lazdei, Lithuania, and Avraham was referred to in relation to his home town. "The Rabbani, the Nagid (prominent person) Reb Yaakov, son of Rabbi Yekhezkel". Yaakov Bardin was the son of an individual called Yekhezkel.‏ He may have been identical with "Yaakov son of Yekhezkel" who appears in the above list. It should be remembered that the Jewish communities in small towns like Serhei at the end of the seventeenth century were very small, numbering a few dozen families . Therefore it is to be expected that these families were intermarried, particular the rabbinic families who sought good matches amongst themselves. Bearing in mind that that the father of Rabbi Avraham of Serhei was called Yekhezkel, and the father of Yaakov Bardin was also called Yekhezkel, and that Avraham and Yaakov both lived in Serhei at the time of the publication of "Or Khakhamim" in 1795, it is possible that the two families were already related. If so, a match within the family circle would have been the obvious choice when a bride was sought for Yaakov Bardin. Records of the Bardin family indicate that Yaakov Bardin's wife's name was Rakhel. For that reason, this author proposed that Rakhel was the name of one of the orphaned daughter of Rabbi Shlomo Zalmen of Vilna, named after her mother Rakhek Kissin who appears to have died in childbirth, and may have been the wife of Yaakov Bardin. Whilst these theories may be the result of a number of coincidences, they provide a basis for further research to verify the exact link between the Gaon of Vilna and the Bardin family. However, since another link is possible, it is preferable to disconnect the Bardin family from this specific link to the database of the Gaon's family and regard them as being descended from an "unknown link". "grandson of the Gaon Reb Eliyahu of Vilna". died 3rd of Av, 5598 (1838)"
The identity of this grandson of the Gaon has not been noted in any of the souces reviewed by this author. The time period is compatible with a theoretic connection between the above Shlomo Zalmen Lipshitz and the Gaon's eldest son Shlomo Zalmen. Shlomo Zalmen Lipshitz, born about 1796 may have been named after the Gaon's son Shlomo Zalmen who died about 1780. Such a relationship would account for the statement by Tidhar that Shlomo Zalmen Lipshitz was a grandson of the Gaon. The term "grandson" was often used by authors and on tombstones to indicate descent of some degree, and not specifically a grandson. If the above theory is correct, Shlomo Zalmen Lipshitz was a great-grandson of the Gaon. If Shlomo Zalmen Lipshitz was identical with the Shlomo Zalmen whose epitaph is quoted above, then his mother was most probably Treina, one of the daughters of the Gaon's son Shlomo Zalmen. If this was so, than Treina's husband was "Tsvi Hersh" who appears in the epitaph as the father of Shlomo Zalmen. That is to say, Treina's husband was an individual called Tsvi Hersh Lipshitz. The Grad family maintains a tradition of descent from the Gaon. Considerable research by the late Dr. Eli Grad did not produce a definitive link, despite the consistency of the oral tradition related independently by many branches of the family. "The tradition of descent from the Gaon has been well established in EVERY branch of the family - though some branches had no contact with others for half a century or longer. In my own case, my grandfather was the source of this information, and he cited HIS grandfather as having transmitted the tradition to him. I am convinced that the fact of descent is accurate, but I have not been able to establish the connection yet. It appears that the missing link is only one or two generations: my grandfather was born before 1850. His grandfather must have been born around 1800 - so the time gap is not too great." "The great wise man, generous in spirit, keen and expert, all his ways are based on truth, and his wisdom is apparent, our teacher the Rabbi Barukh Bendet, son of our teacher Rabbi Yoel, of blessed memory". It is of interest that the very first person listed in "Retzon Yireyim" is "Shlomo the son of our teacher Rabbi Tzvi Friedlander" who appears in the list of subscribers from "Verbelov" (Versbolova). Perhaps it is more than coincidental that the ancestors of two families claiming descent from the Gaon appear prominently in the same prenumeranten list. the relevance of dates and places of residence of the succeeding generations, leads to the theory that the link between the Grad family and the Gaon was through his eldest son Rabbi Shlomo-Zalmen's orphaned daughters as referred to above. Yaakov Grad was born in 1825, so his mother Gittel could have been born about 1800. Thus Gittel's mother (who could have been born about.1780) could have been one the two orphaned daughters of the Gaon's eldest son, Rabbi Shlomo-Zalman of Vilna. That is, Gittel was most probably a daughter of Shlomo Zalmen's daughter Treina and her husband Tzvi Hersh Lipshitz (see above regarding the Lipshitz family). 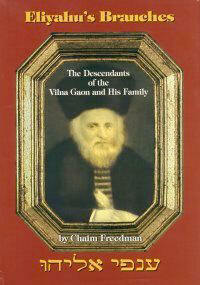 Another relationship between the Gaon of Vilna and one branch of the Grad family was through the Ziv family. The wife of Yaakov Grad, son of Barukh Bendet, was Peena (1817-1913), the daughter of Shlomo-Zalmen-Leib. Family tradition held that Peena was reputed to be a Gaon descendant in her own right. Her maiden name was thought to be "Ziv" or "Israel" . Peena's surname is confirmed as "Ziv" from the memoirs of the famous English businessman, Lord Israel Sieff (originally Ziv). Sieff relates that he was told by his great-grandfather that he was a descendant of the Gaon's bother ‏Joshua.‏ Since the Gaon had no brother bearing this name, it seems that the brother in question may have been Yissakhar-Ber. A common name in the Ziv family was Azriel. It seems that the father of Peena Grad was Shlomo Zalmen Leib, son of Azriel Ziv. The name Azriel was confused in oral tradition with Israel. Exactly which Azriel Ziv has yet to be established, as does the connection by marriage with the Gaon's brother Yissakhar-Ber. Archival records provide further information and will be included here in the future. "My grandfather, Yehuda Leib David Olkenitsky (born 1865) was the son of Yaakov Olkenitsky and Sarah Mera Olkenitsky (nee Rubin). She was, according to tradition a descendant of the Gaon of Vilna. I don't know which of her parents was the descendant of the Gaon. I was given this information by my mother's cousin. Lately I have checked the notes I took about 25 years ago after a comprehensive conversation with my late aunt, Freida Gorodosh (nee Olkenitsky). She maintained another version: according to her, it was not Sarah Mera, the wife of Yaakov Olkenitsky, who was the descendant of the Gaon, but the mother of Yaakov Olkenitsky, whose name was Fruma, and who was either a grand-daughter or great-grand-daughter of the Gaon." Komisar further related that his great-grandfather, Yehuda Leib David Olkenitsky, who operated a wine store in Vilna, had a family tree tracing his descent to the Gaon. This tree hung on the wall of his shop, and when he died in 1910, it was published in a Vilna newspaper. Unfortunately, neither the family tree nor the newspaper article about it, have been located. "The elders of the family told that there was a person by the name of Olkenitsky, who was a cousin of Freida Gittel (grandmother's grandmother). He owned a wine shop in Vilna and in his cellar he had a family tree which reached back to the Gaon. My grandmother believes that apparently the connection with the family of the Gaon is via the wife of Yeshaya Helman (the father of Freida Gittel Gerbish, 1855-1921) and whose name was Reizel. Either Olkenitsky's father or mother was a brother or sister of Reizel." Zelda Tsiftman believed that the family was probably descended from a daughter of the Gaon, although this theory was not firmly established. The obvious common denominator between the traditions held independently by Komisar and Tsiftman enabled this author to link the family trees of the two families which, although they had lived in Israel concurrently for about fiftly years, were not aware of each other. "I would advise you to contact Rabbi Eliyahu Kushelevsky, who is my late father's brother, and who, many years ago discussed our family's descent from the Gaon with Reb Eliyahu Landau of Tel Aviv. According to what I understood from him, the Gaon had a daughter who was widowed at a young age and her two daughters grew up in the Gaon's home, and our descent is from one of these daughters. My late father told me that as a young boy he visited Vilna and a member of his family had the family's family tree, from the Gaon, printed on the wall of his shop." "Many of the families who do not know the exact details of their descent from the Gaon are descended from the two orphaned grand-daughters." The archive of Benyamin Rivlin includes a note about the Olkenitsky family. Apparently Rivlin discovered information confirming that the Yaakov Olkenitsky's father, who Rivlin records as Moshe Dov Olkenitsky, was married to a descendant of the Gaon. Rivlin does not note her name, but, according to the Komisar family, Yaakov Olkenitsky's mother was called Fruma. She was most probably a daughter of Treina Lipshitz, one of the Gaon's orphaned grand-daughters. Based on tradition conveyed by Zelda Tsiftman, Reizel Helman must have been a sister of Yaakov Olkenitsky, thus accounting for the descent from the Gaon of the Kushilevsky, Gurwicz and related families. Further research is required to confirm the above theoretic relationships with the Gaon's family.